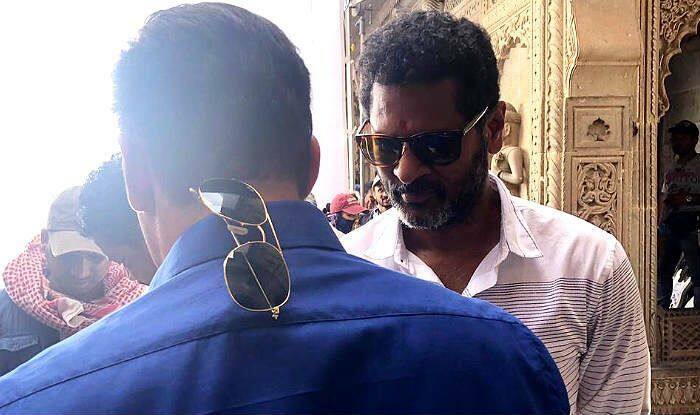 Actor Salman Khan has begun shooting for Dabangg 3 in Indore today, April 1. The film is being directed by Prabhu Deva and produced by Arbaaz Khan. The new still from the film’s set has emerged online and one can see Salman in his Chulbul Pandey avatar though only his back is visible. Even director Prabhu Deva is visible in the frame. Pandey’s signature glasses and crisp solid shirt are shown in the picture as the actor completely dons the avatar of the tough UP cop. Seems like the initial schedule has begun without Sonakshi’s presence on the sets. The actor has returned to play the character of Chulbul Pandey’s wife, Rajjo, in the story. Actor Kichcha Sudeep has been roped in to play the villain in the third part of the franchise. Photos of the two actors are also expected to hit social media soon. Recently, while talking to the media, Salman talked about when he has planned to release Dabangg 3. Making a startling revelation, the actor said he is eyeing a December release for the film this year. Notably, Arjun Kapoor starrer Panipat: The Great Betrayal and Ranbir Kapoor’s Brahmastra are also hitting the screens in December this year. The grapevine is abuzz with the excitement to witness the three big films of the year clashing in the same month. Salman’s fans seem especially excited about the Box Office clash considering the actor is believed to share cold vibes with both Ranbir and Arjun. His relationship with the latter turned sour when the Tevar star started dating Salman’s former sister-in-law Malaika Arora. Meanwhile, Ranbir shares his past with Katrina Kaif, who is considered to be a close friend of Salman. Watch out!